This article was first published by the Herald-Sun on 4 July, 2018. It was by any measure, a remarkable transformation. The room, usually bright, busy and full of cheery noise, was now quiet as a church and consumed by an almost complete darkness. What light there was seeped in from the distant stairwell, the kitchen behind the bar and the glow of a small candle flame that illuminated a photo of Eurydice Dixon. It was propped up on a small stool on the stage at The Highlander Bar where the aspiring 22-year old comedian had performed three weeks earlier. After that gig she said goodbye to her partner and fellow comedian Tony Magnuson, told him “I feel like walking tonight” and, when she was only a few hundred metres from her home in Carlton, was raped and murdered. The mic at the venue had since fallen silent as her tight circle of friends from the comedy scene, her family and countless thousands across the country who never knew of her grieved. Images of Eurydice looped on a screen as people gingerly walked in and took seats, careful not to disrupt the solemnity of the vigil. Once full, Kieran Butler, Eurydice’s mentor and the Highlander’s comedy curator, called for a formal minute of silence. 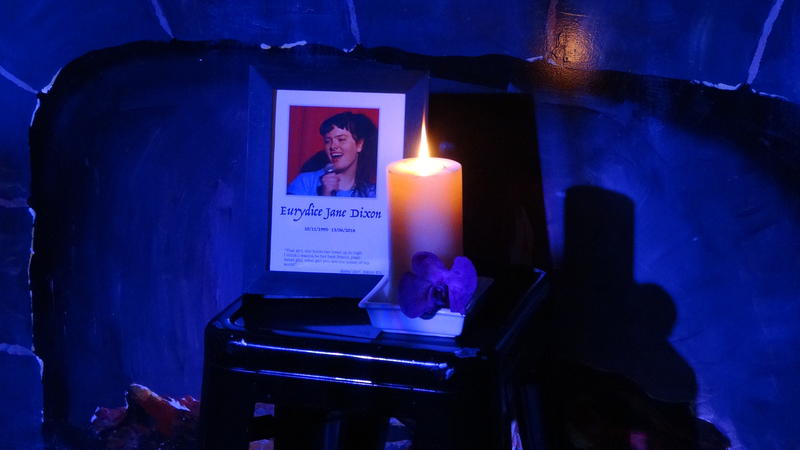 Eurydice Dixon’s picture behind a candle at the Highlander Bar, where her comedian friends paid tribute to her. Still shrouded in darkness, Kieran’s partner Michelle Wilson performed the melancholic Ashokan Farewell on violin. She had only played the piece on three key occasions: her grandmother’s funeral, her mother’s funeral and tonight. With the lights up she was joined by Butler with guitar to sing the Travis ballad Follow the Light, asking people to sing along to the chorus. Then Pradeepa Timmermans performed her self-penned tribute song Remember Eurydice. A moving ode, its vocal imperfections perfectly capturing the room’s heavy heart. Then — suddenly — another transformation occurred. With the tribute formalities over Butler screamed “comedy!” signalling that the time had come to move on and reclaim the space. A huge roster of comedians, many of whom had performed with Eurydice, lined up for their five-minute spots and dutifully filled the room with laughs. Dixon’s partner, Tony Magnuson was hanging out near the stage, ready to do a spot later in the night, if he could hang in there. It was a swish, slick night of rapid fire comedy. Blaise White lamented his coffee addiction and argued about gun control; Jess Pearman reflected about the horrors of living in Monbulk; Duff performed quality prop comedy; Lainie Chait celebrated her Jewish life; Liam Cross described what it was like going to a swingers party and finding himself in the corner reading a book. 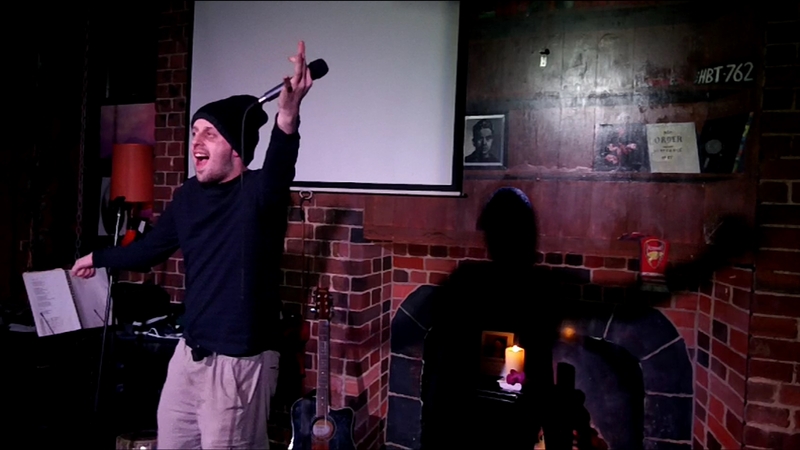 Also on the bill were Becky Steepe, Alessio Carducci, Sofie Prints, Damien Vosk, Gary Johal and many others. They all hit their marks with confidence and frantic energy. There were only a few passing references to Eurydice, about the joy in hearing her delightful laugh and the engaging nature of the comedy voice she was developing. If there was a point where the show was in danger of derailing it was when Tony Magnuson, Eurydice’s boyfriend, took to the mic. He had been laughing loudly during the gig while moving among the gathering, hugging people. Now, after a loving intro from Butler who praised his strength of character, he was up. Was this a good idea? Was it too soon? Perhaps. Yet with a lurching gait, deep shadows under his eyes he took the mic and faced the room. If there was any point in the show where it was going to go off the rails it was now. There was a nervous electricity in the air, even though he was in a setting where any transgression would be forgiven. Yet somehow he refused to yield. He joked about his incoherence, about speaking in tongues. He even delivered some set material. It was an extraordinarily brave feat. Clearly bearing the weight of an unimaginable grief, he held it together. And the room showed its love. Speaking to several of the performers afterwards there was open admission that the old joke about comedy being a form of therapy was true and that the evening had been cathartic. As heavy as everybody’s heart would always be, it was time to move on. After the gig was over and the room was empty, with the candle still casting a glow around Eurydice’s face, the full meaning of the night became clear. As a tribute to somebody whose talent was only starting to make itself felt, the gig punctuated a period of communal grieving that would ensure her loss is now forever stamped on the Melbourne comedy scene, how on every stage there will always be a void Eurydice Dixon was meant to occupy.